8:14am A theft report was taken in the 100 block of W. Perry St.
12:14pm An overtime parking complaint was investigated in the 100 block of E. Rensselaer St.
1:08pm A report of a cat stuck in a vehicle was investigated. The cat was just trying to stay out of the rain. 1:42pm Officer responded to a disturbance in the 300 block of N. Sandusky Ave. and a juvenile patron was warned against trespass. 1:57pm A false alarm was investigated on Lincoln Highway. 2:27pm A traffic warning was issued. 2:54pm Debris was removed from the roadway at Perry & Walnut St.
3:04pm A 911 hang up call was investigated in the area of Lane and Charles St. No emergency and resident was unaware of the call. 3:28pm Officers assisted Life Support Ambulance personnel on Marion Rd. 3:49pm A report of two suspicious persons in the area of Spring & Rensselaer St. was investigated. Their car was disabled and they were retrieving property from it. 4:25pm An individual was arrested for a drug offense out of a traffic stop at High and Irving St.
4:57pm A report of vandalism to a car was taken in the 900 block of Whetstone St.
5:31pm Officers assisted a motorist locked out of their vehicle in the 100 block of W. Warren St.
5:38pm A parking complaint was investigated at Outhwaite Reservoir. The vehicle belonged to subjects that were arrested for drug offenses and were in the county jail. They made arrangements with a family member to move the vehicle. 5:49pm A report of a traffic hazard was investigated in the area of Warren & Kearsley. 6:07pm An overtime parking complaint was checked on Short St.
8:03pm Officers conducted a welfare check in the area of Kaler Ave. and W. Oakwood Ave. An individual was served a summons. 8:18pm A report of a loose dog in the 1300 block of Edgewood Dr. was investigated. A neighbor assisted the officer coaxing the dog back to its residence. 9:14pm Officers assisted Life Support in the 1100 block of Tiffin St. with an intoxicated subject that had fallen and was injured. 9:25pm Officers warned 2 males against trespassing in the Earl St. area. 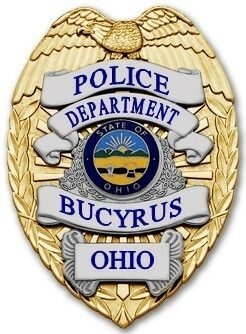 9:39pm Skyler Mease, 18, was arrested for disorderly conduct and underage consumption of alcohol. He was issued a minor misdemeanor citation and criminal summons and taken to the Crawford County Justice Center to be held until sober. 9:57pm Officers warned a resident in the 1500 block of Fairview Ave. against setting off fireworks. 11:58pm A report of a driver following other vehicles too closely with the bright lights on was checked in the area of W. Southern Ave.
12:05am A report of a barking dog in the area of Wiley St. and E. Mansfield was checked and the resident took the dog inside. 12:22am A theft reported in the 500 block of Jones St. is under investigation. 12:24am A report of a suspicious vehicle at the Clark Station on Marion Rd. was investigated. It was found to be an employee. 12:53am Officers investigated a suspicious vehicle parked at FC Bank. The subject was found to be waiting to use the ATM. 2:29am A traffic warning was given in the area of S. Lane St. and E. Warren St.